PAL Region Code. Case - hinges intact, no cracks good condition. Release Year: 1998Genre: Racing. Other (22). all Cd's are fully tested. Hand Held / TT Gaming Consoles (2). Accessories (2). Region Code: PAL (UK Standard)EAN: 5024866240757. Codemasters really, really wants you to be evil. In Overlord: Minions, the action tightens up as you take command of a smaller team. While you play as the Overlord, however, the stars of the show are the Minions. Compatible With Nintendo DS, DS Lite, DSi, DSi XL. 2DS, 3DS & 3DS XL. 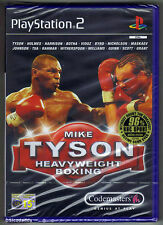 MIKE TYSON. HEAVYWEIGHT BOXING. PAL FORMAT. No responsibility will be taken for non-compatibility. CLAIM PROCESSES CAN TAKE A FEW WEEKS. ORIGINAL BLACK LABEL. MANUAL HAS LIGHT SIGNS OF USE. Title: Prince Naseem Boxing. Title : Prince Naseem Boxing. Platform : Playstation, PlayStation. Condition : Good. List Price (MSRP) : 9.99. Feature 1 : Winner stays on feature up to 8 players. Release Date : 2000-11-03. This is for serious collectors or could be a great gift in this condition. MINT CONDITION = An item missing its original seal but has been kept in unused condition. Disc- AS NEW MINT no visible scratches or marks on it anywhere. PAL Region Code. Case - hinges intact, with no cracks good condition. 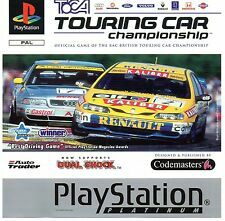 TOCA 2 TOURING CARS - RARE BIG BOX EDITION. Besides the TOCA races, each of the venues also features special racing events where all drivers race identical cars. This seriously affects your driving and pitting strategy. RISE OF THE ARGONAUTS. But Jason also has many friends. They will also gain strength if Jason is near them and unleash powerful special abilities. Each god gives Jason access to a different skill tree with many different types of buffs and abilities waiting to be unlocked. There is also an extra disc in the box, Toca 2 Touring Cars. COLIN McRAE RALLY - RARE BIG BOX EDITION. The Rally HeadCamTM allows you to rally from the perspective of a real Rally driver. You can play against either the computer or a friend, in 2 Player mode. Real-world physics and animation engine. Take on Naz or be Naz. Lightning play speed - dodge, block, weave and hit back at blistering pace. Instruction Booklet Included: Yes. Platform : PlayStation, Playstation. Condition : Good. List Price (MSRP) : 19.99. Release Date : 1999-07-09. Sony Catalogue SLES 50396 EAN. Overlord: Dark Legend (Nintendo Wii) - European Version. Complete In Box. Good!